Let me share with you today my friends, my dream. I have a dream that one day I own my very own shop. It’s an idea I’ve been toying with ever since my passion for chocolates & pastry became obsession. Exact ideas of it keeps changing, no, more like evolving. First it was a 100% chocolate shop selling my handmade bonbons/ truffles alongside the best & largest collection of chocolate bars from around the world lining one wall. I thought of tricks like “Top 10 Bars of the Month” & “Coco&Me Reccommendation” panels just like what you’d see done in large bookstores, & to make brands compete. I imagined it as the ultimate hub for serious chocolate lovers in London where they don’t have to sift through inferior brands to find the gems. – The working kitchen would be visible from the shop so that the customers understand straight away that the bonbons by the counter are all properly handmade. There’ll be me, moulding chocolate shapes in this kitchen, & I could organise demonstrations & workshops to be held there too. – The shop will also have a small cafe area to serve the best hot chocolate in town, & plated desserts such as warm chocolate souffle served with cacao nib clotted cream ice cream. – The shop decor would be :: clean but warm & comfy like visiting grandma’s old kitchen, slightly scandinavian in design, lots of quality wooden furniture, with original shaker stove with it’s black pipe work dominant. As my passion for pastry became too prominent for me not to ignore, the shop idea evolved to also serving cakes, etc. I would display the cakes just like I do at the market – on one long table. In the ideal world, I would live above the shop a-la “Chocolat” the movie. No wasting time with commuting in to work, & I’d also be able to be around to see my kid grow while I work. Then my fascination tentacles started to touch the subject of Tea & Coffee that I’d want to serve in my cafe. First off, I bought two dozen tea types from Whittards online (darjeeling, kenya, keemun, assam, lapsang souchong, white tea, etc). As I go through my stock of teas that will last me for many years to come, I read up several books on tea (about origins, how to pour the best cuppa, & how to appreciate each flavour). Next, I wanted to learn how to do latte-art, so I bought this fantastic book from amazon.co.jp called 女性トップバリスタが教えるエスプレッソ&コーヒー which has a teaching DVD of a barista showing you how to draw with the milk foam, aswell as the correct way of making different types of coffee with different equipments (ie: filter, syphon, etc). 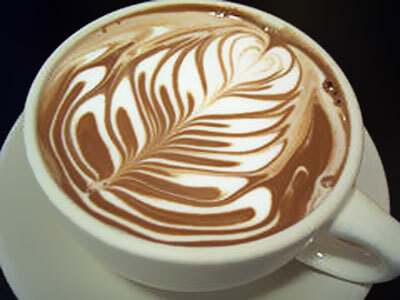 I really think that if a cafe served their cappuccino like the pictures below, you’ll be the talk of town for sure! Anyway, to cut this rather long blog-post short, I’ll fast forward away all the other ideas I’ve been pondering on, & write about my most recent idea for my shop. The idea came when I saw an article on Housing Works Used Book Cafe in New York (see picture of cafe at the top of this post). First off, I fell in love. It’s the sort of place I would L.O.V.E to go to – even on my own. And that’s mighty special because I’m a sort of person that just CAN NOT go places alone because I’d be too conscious with the other people in the room, I just won’t be comfortable. When I found out about the HW cafe, I felt instantly that this was the ‘plus alpha’ that I was looking for. Y’know, that ‘something’ that makes a place special. I can imagine running a small patisserie in a used book shop. I love books, I wanna be surrounded by books, & the more I think about it, I really think that secondhand books are the way to go, what with today’s consumers are so much more conscious in terms of recycling! Currently, I’m pondering wether it should primarily be a “library” with a purchase option, if the customer decided to buy the book instead of borrowing it. I think I prefer it that way. Yess, a library with a very tasty patisserie/ cafe/ tea room! – I love that the Housing Works’ profits goes to a worthy cause, I myself personally donate to three organizations every month since 2 years ago, & I’ll want to duplicate their ethos & put the profits from the library part to a charity too. To be honest, there’s so much I want to do – I want to serve full english breakfast in the morning, I wanna do ‘afternoon tea sets’, I want to serve alchohol & open late in the evening, like til 2am. I’d organise events & workshops. I’m imagining the cafe to be a self-service style – they get a tray & I serve them from behind the counter. Easy style. It’ll be a quiet, cozy place with varied selection of books, where there’ll be comfy armchairs & proper desks to work on. Oh, & most importantly, clean bathrooms! I know that now is not the right time to make this a reality. Right now, I have a much more important project at hand: being a mummy to my little kiddo. I’m up to my neck with life as is now, so how could I possibly add any more projects?! I don’t know anything about running a proper business, & I certainly haven’t a budget for it! And so even though today & tomorrow, it won’t happen, I will like to think that I’m in the ‘process’ toward it. So with this faith, let me ponder away til then & keep on dreaming! What a wonderful dream you have! Do ponder away & let us have an update please! By the way, good on you for donating to three (!!) charities! What made you decide to do it? Anyway, if you do open a library, I will love to be a member…! I first started donating to the Red Cross when I heard the news about the Indian Ocean Tsunami on boxing day 2004. Then the next time I decided to donate to another was when a friend of a friend died with cancer leaving behind his children, so I started donating monthly to Cancer Research UK aswell. The third was more recently, to the Amnesty International when I heard that an Iraqi Kurdish lady was stoned to death by a crowd (honour killing), because she was in love with a Sunni Muslim boy. I only deposit £10 each per month though – & I hardly feel the difference, because it’s all direct-debited from my account…! I’d say just email your post to some clever investors/venture capitalists and bingo, you get funding for your amazing café! 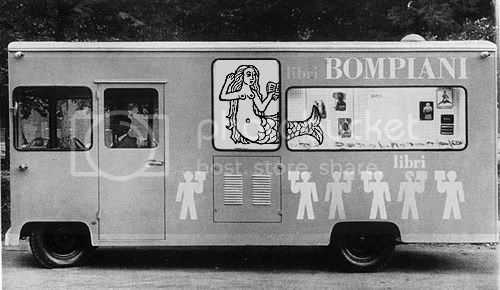 It’s very funny: just yesterday I was on ichat with a friend discussing the utopian idea of setting up a trans-European mobile library and bakery in a van (inspired by the mobile library Enzo Mari and Bruno Munari designed for an Italian publisher in the 60s). Oh the common ground just keeps growing. Books and baking together is my nirvana! Hey Jacques, how are you doing? Are you in Lewes perhaps?? The Munari mobile library you mention, it sounds good – I tried google, but couldn’t find a pic – do you have any suggestion link to where I might find one? Hi Laura! I know! It’s funny how we both like so many similar things! Hi Tamami! Not in Lewes, alas. We decided on Stoke Newington instead for now. Oh I’m so for that! And I’d sooo join the company! Hey Jerry! I’m glad you like the idea, thanx! Hi!Great to read all that as I’d love to own a bookshop cafe too but I am sure the reality is v different from the fantasy!!! I love books but am not good enough for the baking side of it. 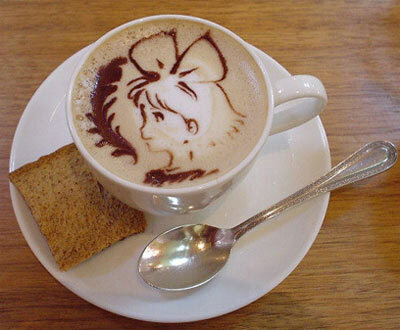 Those coffees look great, I have seen a couple of the Ghibli films – the children love The Cat Returns (friend bought it for us). Have you been into the new 2nd hand bookshop in the High Rd – I had a quick browse while with the kids but would love to on my own. By the way, “I” left his red car here and I have put it in cupboard until I see you next!! Hi Claire!! 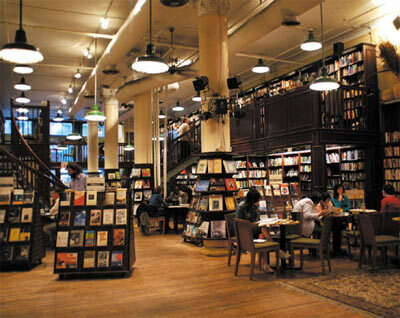 Y’know what, I still haven’t been to that bookshop – been meaning to… but like you say, I’d rather go when I’m on my own! Ghibli films are truly my favourite animation films, and if you get a chance, buy a film by them called Totoro – that’s my boy’s favourite! I’ll drop by sometime and pick up that red car then! Or if the weather gets aby better, maybe we can go to the park! I love the idea of a cafe with a library. In Japan, so many cafes have bookshelves with books you can read while you’re at the cafe. It really makes the atmosphere cozy and comfy… I can’t wait to visit yours though! You do have such a lovely dream .. well it is good to dream cos one day that dream might turn out to be a reality. Your cakes looks so sumptuous. Enjoyed reading your blog and admiring your marvelous creations. Thanks for sharing your recipes and tips. Your are such a charitable person … good things will come to good people. Keep up your good work !! I am reading your comment when I am very tired after a days work, & which will continue, as I still need to put the finishing touches to the cakes in time for tomorrow. So your comment really is in good timing to give me that extra boost. Thanx! Rather than me, I think your sure-bet would be to ask your local council (or sometimes they have a page on their website) – they’ll have leaflets regarding food safety, registering premises, etc. You’d also need a Public Liability Insurance, register as self-employed, food safety certificate, at the top of my head that’s what’s needed I think. Good luck with your stall! Do let me know how things go!! Wow, I know this is a really old post, but I just found your blog and cannot tear myself away!! Congratulations on all that you have achieved and I sincerely hope that your dream (like mine) can become a reality one day. I also need to say how much I adore that coffee with Kiki!! My puppy (well she’s 6 now! lol) was named after that same Miyazaki character!! ps: good choice on the fab dog name! !